The fourth quarter of 2018 was turbulent throughout. Performance was the worst since 2011, with the S&P 500 down 13.52% and the S&P MidCap 400 down 17.28%. The Russell 2000 was pummeled by over 20%, leaving it and most other domestic indices in a bear market. November offered a glimmer of hope that there would be a so-called Santa Claus rally to follow, but December turned out to be one of the worst on record. Investors feared that a looming slowdown in growth may be met with rising interest rates due to monetary policy. At its December meeting, the Federal Reserve announced it was indeed increasing interest rates by 0.25% and signaled further increases may occur in 2019, which spooked markets and resulted in a deeper sell off into year end. In the days since, the Fed Chairman has tried to back track a bit with a more dovish tone. While this has helped buoy markets to start the new year, we are eager to hear commentary and outlooks from management teams when companies begin to report fourth quarter earnings in the coming weeks. A large deceleration in growth could again spook the markets, as could the failure of a U.S./China trade deal to materialize. 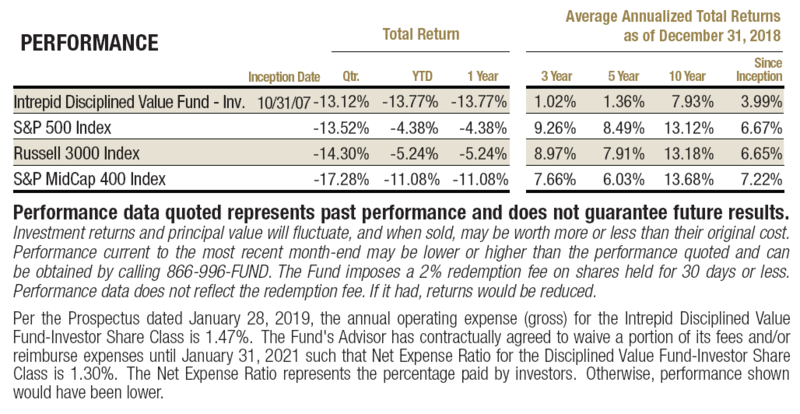 The Intrepid Disciplined Value Fund (the “Fund”) lost 13.12% in the quarter. While we never like to lose money, we were able to outperform our benchmarks and the delta was even more pronounced in the month of December. For the month, the Fund was down 7.83% compared to declines of 9.03% for the S&P 500, and 11.32% for the S&P Midcap 400. We were able to put some cash to work during the quarter, but we were not overly aggressive in doing so. We find it prudent to keep some dry powder at current valuations so we can take advantage of extreme dislocations should prices continue to fall. 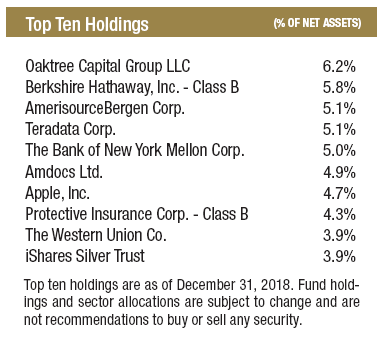 The top contributors to performance in the fourth quarter were Dollar Tree (ticker: DLTR), Party City (ticker: PRTY), Teradata (ticker: TDC), and iShares Silver Trust (ticker: SLV). We have written about Dollar Tree in the past, including last quarter when we increased our position in the retailer. The equity materially outperformed the market in the quarter, returning almost 11%. Its business tends to do well in recessions, which may be one of the reasons investors viewed it as a “safe haven” while the broader market sold off. In early January a well-known activist hedge fund disclosed a stake in the company and made public a letter it sent to the Board of Directors urging change. The two major changes it believes will unlock value are an outright sale of Family Dollar and for Dollar Tree to introduce price points above $1.00. We are advocates of the proposed changes and agree that the shares would likely re-rate higher if either or both are undertaken. Party City is a new position for the Fund. The company is the largest party goods retailer in North America with about 900 locations. It isn’t just your average retailer, as its business is vertically integrated with wholesale and manufacturing operations as well. We purchased shares when it was trading for about 6x earnings after reporting disappointing quarterly results. The company is facing supply chain disruptions in China as importers race to make purchases ahead of a potential 25% tariff. Labor shortages and higher freight costs negatively impacted the company, but we believe that these issues will be resolved in the near future. The other unusual situation is a helium shortage that has resulted in prices 15% – 25% above normal. This may not seem like a big deal, but Party City has about 60% market share in metallic balloons, and it is a key segment of their business. Helium shortages happen from time to time with the last being in 2012/2013. Our view is that this too will be resolved soon. Management has signaled their confidence by putting their corporate and personal money where their mouth is; not only did the company announce a $100 million share repurchase program, but the CEO recently purchased ~$1 million in shares in the open market. While the company carries a debt load that exceeds what we are typically comfortable with, it also generates a substantial amount of free cash flow, which will help to pay down debt in the coming years. We have written about Teradata in the past and continue to view its prospects favorably. The company is at an inflection point in our opinion. We should begin to see financial metrics improve after having been under pressure due to a transition from a licensing model to a subscription model. It will not happen overnight, but we continue to believe shares are undervalued based on normalized earnings and free cash flow. The top detractors in the quarter were Apple (ticker: AAPL), Protective Insurance Corp (ticker: PTVCB), and Laboratory Corp of America (ticker: LH). In November, Apple provided forward guidance that was below expectations and sent a cautious tone to the overall macro environment. Management disclosed that it will no longer break out its iPhone units going forward. This was bad timing as unit growth had stalled in the quarter, prompting some investors to wonder if they are trying to hide an imminent downturn in iPhone sales. We had sold a small portion of our position prior to the announcement but did not foresee a drop in share price of the magnitude experienced. We continue to believe that its fast-growing services segment will help to fuel profitability, as will new product launches and entry into new categories like health. Protective Insurance continues to experience challenges in its commercial auto business. This is not a company-specific issue, as others in the business are struggling similarly. In response, Protective has been aggressively increasing rates, but that did not prevent it from recording a large adjustment to its reserves this quarter. To make matters worse, the CEO abruptly resigned in October, adding to a growing list of departures of executives and board members. The shares remain very cheap at only 64% of tangible book value, matching the company’s trough valuation during the financial crisis. We contend that the shares are worth significantly more than where they trade today and were pleased when the company announced in October that it had formed a sub-committee to explore opportunities to maximize value, often a precursor to an eventual sale. Labcorp had a rough fourth quarter as industry headwinds became too much to overcome. The company’s largest segment experienced a deceleration to almost flat organic growth, driven by a slowdown in the consumer genetics business, 23andMe. The company lowered expectations for this year and next, which sent shares lower. Labcorp’s main competitor was not immune to the industry headwinds and is experiencing similar growing pains. We are more cautious on shares now that organic growth in its diagnostics business is minimal, as we are concerned that the deceleration may be structural in nature. That said, the Covance business is growing quickly and accounts for about 30% of operating income, which should help to offset some of the weakness in the core business. The pullback in the market was broad and left few companies unaffected. We believe the steep selloff just before Christmas may have been exacerbated by normal year-end dynamics – traders and decision makers out of the office, low trading volume, tax loss selling in some names, and fund redemptions causing forced sellers (particularly in some ETFs). As a result, we think some securities were unjustly punished. Right now, we are seeing more attractive opportunities than we have seen in a few years. We are busy combing through the rubble to find high-quality businesses at good prices. We look forward to checking back in next quarter. The S&P 500 Index is a broad based, unmanaged index of 500 stocks, which is widely recognized as representative of the U.S. equity market in general. The Russell 3000 Index consists of the 3,000 largest companies in the U.S. as measured by total market capitalization. The Russell 2000 Index consists of the smallest 2,000 companies in a group of 3,000 U.S. companies in the Russell 3000 Index, as ranked by market capitalization. The S&P MidCap 400 Index seeks to track the performance of mid-cap U.S. equities, representing more than 7% of available U.S. market cap. You cannot invest directly in an index. Free Cash Flow measures the cash generating capability of a company by subtracting capital expenditures from cash flow from operations. Tangible Book Value is is the total net asset value of a company (book value) minus intangible assets and goodwill. Dry Powder refers to having cash available for possible opportunities to buy securities during declines in the market.